Posted November 27, 2018 – After graduating from the University of Kentucky with a bachelor’s degree in romance languages, Stephanie Knight dreamed of getting an exotic overseas job with the United Nations. When that didn’t happen, she moved to Houston to work as a teacher. In other words, just because she could speak Spanish and French didn’t mean she could teach them. Still, Knight knew enough that she really liked teaching. And she wanted to improve. So, she left the classroom to pursue a master’s degree and certification in secondary teaching from Lehigh University in Bethlehem, Pennsylvania. She later earned a doctorate in curriculum and instruction from the University of Houston College of Education. 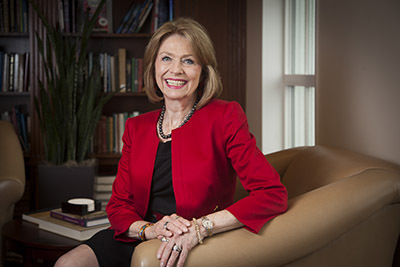 Today, Knight is serving her second year as dean of the Simmons School of Education & Human Development at Southern Methodist University in Dallas. Aspiring teachers, she said, need rigorous preparation and real-world experience – a formula also embraced by UH but uncommon among quick-entry alternative certification programs. Knight spent the bulk of her career as a professor at Texas A&M University in College Station but conducted her research in Houston, where there was a greater population of traditionally underserved students. She had become passionate about helping at-risk students after teaching in Bethlehem, where the immigrant community struggled after the once-bustling steel mills closed. Her next K-12 stint was teaching elementary school in Saudi Arabia before she returned to the Houston area to teach Spanish and French in the Klein Independent School District. At A&M, Knight ran a special program to better prepare teachers for urban schools. With grant support from the Houston Endowment, she took cohorts of student teachers to train in Houston ISD and paid them housing stipends to live near their schools. Of those who completed the program, Knight said, 94 percent went on to work in urban settings – a key marker of success. The Houston Endowment also increased its support, providing the College of Education at Texas A&M University a $3 million dollar endowment to fund the ongoing activities of the Houston program, including scholarships for students and two endowed chairs in urban education. Knight was the first recipient of an endowed chair. A prolific researcher, Knight said her interest in scholarship began as a doctoral student at the UH College of Education. She was mentored by then-professor Hersh Waxman. After 20 years at A&M, Knight joined Pennsylvania State University in 2009 as a professor of educational psychology. In 2013 she was promoted to associate dean, overseeing the College of Education’s undergraduate and graduate studies programs. She became dean of SMU’S Simmons School in August 2017, the second permanent dean since the school opened in 2005. “It’s great to be back in Texas where it all started,” Knight said in a recent interview. Steven Currall, SMU provost and vice president for academic affairs, praised Knight’s track record of scholarship and partnerships when announcing her appointment. “Stephanie Knight’s impressive background of scholarly excellence and outreach to the education community will enable her to deliver visionary leadership to propel the Simmons School toward even greater visibility and impact,” Currall said in a statement at the time. Bob McPherson, dean of the UH College of Education, said he was thrilled to have a fellow UH graduate as a new colleague. Knight said she’s particularly excited about a recent grant from the Toyota USA Foundation to create a model school focused on science, technology, engineering and math in partnership with Dallas ISD. The grant allows for three years of planning to implement best practices in teaching as well as wraparound services to support the overall well-being of students and their families.